Last week we discussed the work of David Hawkins, Ph.D., M.D. and his theory that, “To become more conscious is the greatest gift anyone can give to the world.” Simple kindness to one’s self and all that lives is the most transformational force of all. As a holistic healer, one of the questions I’m asked most often is “How to you recalibrate or raise your consciousness?” Or “What types of things do you do personally to keep yourself (mind, body and spirit) aligned, so that you can help others?” This week, I’m going to answer that question. I find that one of the easiest ways for me to shift energy is through sound or music. Taking a sound bath in pure positive vibration can lift anyone’s spirits quicker than anything. Studies show that if you are feeling tired or down, 10 minutes of uplifting music or exercise (i.e. a happy song or simple walk around the block) are shown to create almost instantaneous improvements in well-being. Kirtan is a very different kind of music. Based on ancient chants, it has the ability to quiet the mind if listened to with intention. Everyone experiences Kirtan differently, and it doesn’t have to be a religious experience. You can think of it as a sing-along. A Kirtan concert is not your typical concert either. Most everyone sits on the floor, although chairs are usually available. The performers are accessible, in fact there’s not much of a distinction between performers and the audience. The wallah (leader) sings the mantra, and the participants sing it back. As you sing with each other you experience a deep connection with the musicians, the other participants and yourself. And when the music stops, your mind is quiet. Because Kirtan’s roots are from India, many of the songs are sung in Sanskrit. If you’ve ever chanted responses in Latin or Hebrew traditions, then you know how powerful singing in an ancient holy language can be. Kirtan is a non-denominational way of singing. It is the Universal language of Spirit, the song of the Soul. Below you can check out a video of our way of doing Kirtan in our small seaside town. Our group meets once a week at a non-denominational church that donates the space to us. Our gifted and talented leader plays harmonium (one of many instruments in her portfolio) and calls the mantras. 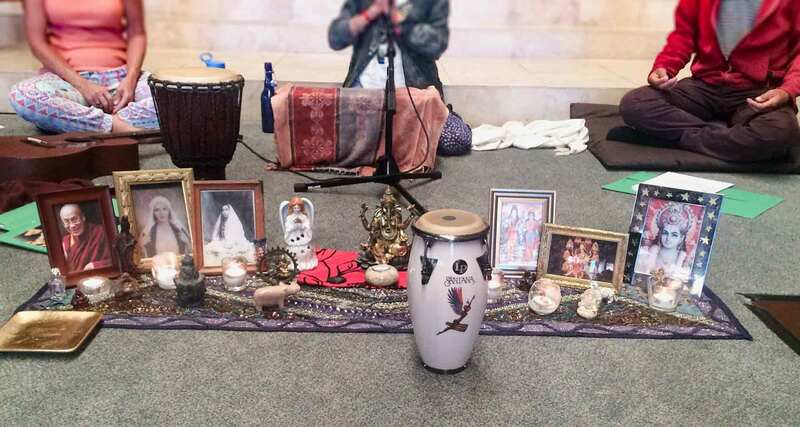 She creates the beautiful altar, pictured above, honoring all of the Kirtan masters. We are all invited to sit on the floor or in the pews, whichever is most comfortable. And we are all welcome to play an instrument, as well. I can’t make it to Kirtan every week, but I always find myself singing the chants when I want to feel good or need to shift out of difficult energy. This high-vibration sound technique always lifts me up and raises my consciousness! Let us know in the comments if you have experienced Kirtan or mantra chanting and what effects it has had for you? Also, let us know if there’s a particular song that always makes you smile. Wishing you the huge love, compassion and happiness that Kirtan brings to me. Namaste! May I bring to you attention another example of the power of Kirtanas? Thanks for your recommendation. It’s always nice to learn about new and different things.